Despite the fact that the sewing room is the one room in the house that is in complete and utter CHAOS (as in barely been touched or tended to since all the stuff was moved into it months ago), I got it into my head today to attempt a sewing project while Kiwi was sleeping this afternoon. I am a pretty laid back mommy . . . no schedules, nurse on demand, etc . . . I think I am starting to understand her rhythms, but I certainly have no idea how long she will stay asleep at any given time of the day. Deciding to "work on a little something" becomes a bit of a dance with Kiwi . . . how much can I get done in what amount of time? Do I take the kind of time I would normally take and perhaps spread a small project out over days (and perhaps weeks depending on when I can come back to it), or do I just hack away at fabric semi-crazed and let some of the painstaking over-analyzing and measuring fall to the wayside? In case you missed the title of this post . . . I went for B. Up on the docket for this afternoon, making a new changing pad cover. Simple. Google around and you'll find approximately 8.2 billion tutorials that you would almost swear copied off of each other exactly, and a bunch of patterns/tutorials selling for around $5 a pop on Etsy. I'm pretty sure that even without said googling, I could have figured out this whole thing on my own. (Dare I believe at this point in my sewing career I can come up with this stuff all on my own? I do indeed.) The thing is, as I said, I was going for SPEED. So I landed on a tutorial among the millions available, glanced at it quickly, grabbed some fabrics from the stash, and started chopping and sewing like a mad woman. Of course it did take me a wee bit longer than it should have seeing as I had to make it more complicated and use several different fabrics instead of just one. Silly me . . . 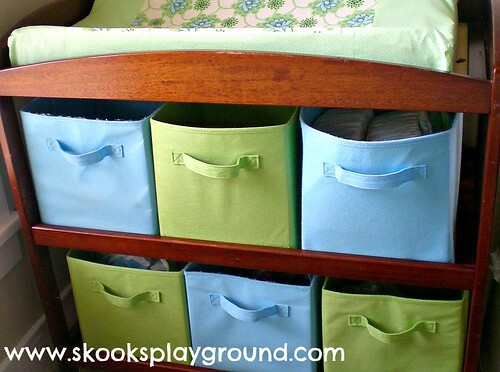 I had a vision of tying the colors of the canvas drawers we are using in the table in with the fabrics in the new changing pad cover. And only using what I had on hand. Too bad when I finished (triumphantly!) and put it on the table I saw that the green of the bins really is NOT the green in the fabrics . . .
Umm . . . kind of mint vs. grass green? What was I thinking?? Ah well. I guess I should have spent a wee bit more time on the fabric selection process. Lesson #2 of the day: You should make sure you are well-rested when you go to do fabric selection. I must have been totally out of it when I held up my fabric contenders because I could have sworn that they matched PERFECTLY. Whatever. I still like it. And it matches the bins better than the previous covers anyway. And I used up stash fabric that I've had FOREVER. So it was free. -Outer: some leftover green on green dot fabric I had from a previous project - - will find the name of it later . . . I love your logic, I too would have considered it "free", and using up anything in your stash is always a plus... gotta make room for more stuff ya know. And I think it looks GREAT, nothing wrong with different shades of green - and better than it was (one of my favorite mottos)! Congrats on getting back into the sewing scene... baby steps (wink-wink)! Thanks! I've got all but the interfacing pieces cut out for LM's lunch bag. That will be my next speed sewing project! I LOVE the colours and the pattern! Great job!